Blue Nile, as the largest online retailer of diamonds and jewelry, is the best place to buy certified diamonds and fine jewelry in USA. With Blue Nile, choosing a wedding or enagagement ring becomes easy and convenient. Since Blue Nile online site has a user friendly interface and choosing your favorite style or type is easy. For instance, under the category of diamonds, you will see different shapes and colors available, and you can filter conveniently by your preferrences. What makes the user experience even better is Blue Nile site has detailed shopping guides for all, there you can familiarize yourself with the terms on diamonds & settings. If you are expecting some cheap jewelry from Blue Nile, find them here at the sales page! How USGoBuy helps you buy from Blue Nile and ship to your country? One problem may arise when you try to order with Blue Nile, and that is the high shipping rate, taxes or duty. With USGobuy, you can rest assured about such problems. USGoBuy can help you buy from Blue Nile,or you can place the order yourself on Blue Nile US site with the forwarding address given by USGoBuy. Either way works for your online shopping at Blue Nile. When your items arrive at USGoBuy warehouse in Oregon, you will get informed. 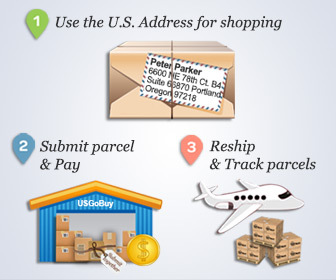 Then USGoBuy arranges international shipping thru couriers like DHL or USPS. As long as your country's customs regulations allow the shipping of jewelry, you can wait for it just at your doorstep. However, there are some countries that do not allow shipping jewelry. For more information on whether your country accepts shipping of jewelry, please check our international delivery page or search it online.